This is rather interesting. David Bradley, chief of Atlantic Media (which publishes The Atlantic), has launched a new elite business publication that is already challenging The Economist. 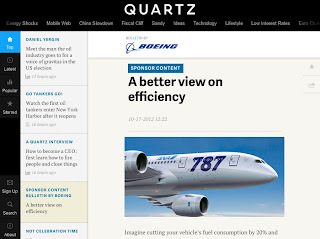 In September Quartz, available only online at qz.com, booted up with 20 writers; in October it surpassed 850,000 unique visitors, already matching 10% of the global traffic over at The Economist. As with all advertorial copy, the story reads with whiffs of ecstatic silliness and awkward prose (advertorial writers tend to sound as if they are walking backward, and are always surprised that the product they are writing about has “exceeded expectations” of some sort). But at the same time, the sponsored content is compelling, breaks out of the clutter, and is clearly labeled as such so in no way tricks the savvier reader who just wants to consume pure editorial. 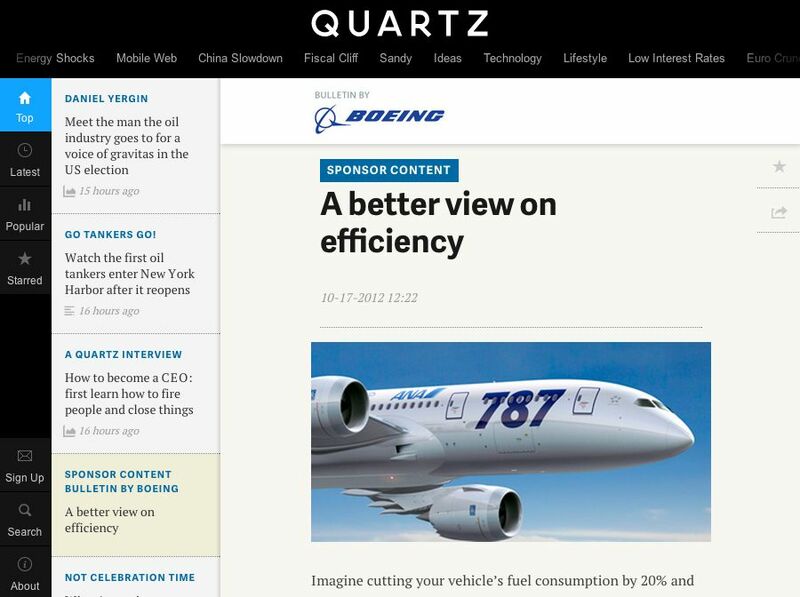 With Quartz, Bradley is betting big that standard banner formats aren’t the best way to monetize digital in mobile, especially on the small iPhones and Droid tablets loved by upscale business travelers. When space is small, advertisers have to be more clever about how they fit in. David Carr at NYT reports the strategy may work: Atlantic Media, after years of fighting the deadly decline of print, has refocused on digital content to double revenues from $20 million to $40 million in the past four years and now is back in the black. And Quartz has one more secret weapon: Unlike The Wall Street Journal and The Economist, it has no paywall or subscription fees — presumably because it can float on the hefty premiums from its advertorial. Open systems flourish, and in a world of social media where users like to share content freely, open systems also tend to get lots of monthly unique visitors.